So lets get some real info about you. Specialty - Guns, archery, automotive ,stainless steel products and animal skulls. We have recently developed and are currently marketing film and dipping exclusively for 2 camo clothing companies. SKRE gear and Gamegear camo. Perfect guys! This is exactly what we need. I guess ill have to change my business cards after training next week lol. wonder though if it's people shopping around.. playing us against each other for the cheapest price. @smedlin if they are doing that? Let them! Competition is a good thing. Unfortunately you're the only one that can price a job to where you know you will make a profit. You have to stop being scared if your price is too high. I'm guilty of this as well. We can't work for free, and there is no shame in turning away or losing a job. I've had some of the most excited customers fall through after hearing my price. All they heard was "custom, color matched candy clear, show gloss finish, etc" but failed to see all of that comes with a price. I had a guy call up that wanted an image put on his skateboard. He needed it sanded and filled, metallic basecoat, airbrushing, clear so thick that it would never be damaged, he wanted the trucks dipped in a different pattern... I quoted him a price of at least $500 but not to exceed $800 without approval. (he wanted the film to be a singular image of his design but didn't want any distortion in it, which I had no idea if we could do or not on the first attempt). He went COMPLETELY silent... "the board is only worth $300". I had no idea how to respond to this... all I could do was laugh. He didn't call back. I don't feel bad. I would have followed up with "There are these DIY kits on Ebay. The Youtube videos make it look pretty straightforward. I am sure you could do it much cheaper than I could anyway. Be sure to bring it by the shop when you are finished so I can see how well it went". Specialty: If it can get wet, it can get dipped. 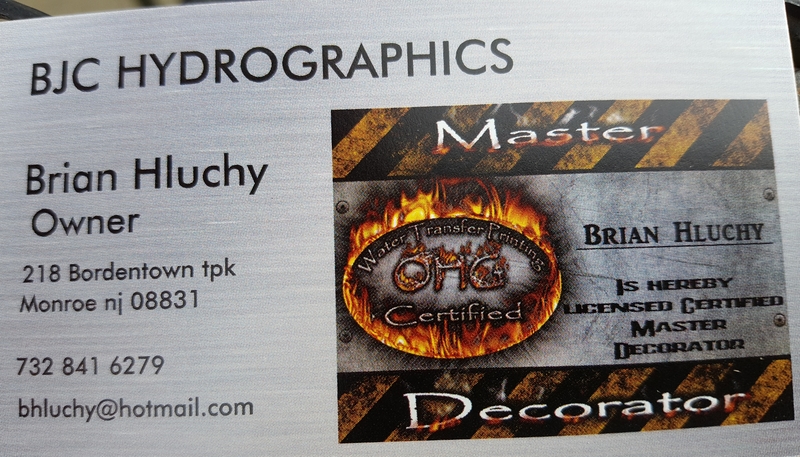 Services: Hydro dipping, painting, sand blasting, glass etching, custom vinyl lettering/graphics. @WileECoyote I put the wrong phone number up when I 1st posted. I have edited since then. Company Name: Mid-Ohio Hydrographics, LLC. Mid-Ohio Hydrographics is a full-time, production level hydrographics facility focused on providing high quality camouflage decorating services to OEM manufacturers and outdoor enthusiasts. We utilize custom designed, high-density fixtures and automated systems to ensure a consistent, efficient, and cost effective decorating option for your business. Whether you need 1 part or 10,000? We have you covered! We are officially licensed Realtree and Mossy Oak decorators, as well as Certified Cerakote Applicators. Anything else that you feel sets you apart... I have 22 years experience in the automotive painting industry, I know, and like to paint! @SkinEDippin Wait, WHAT???? Jon, TWN prints custom film? I always though I had my ear to the ground about custom on-demand film printing. But this is the first I've heard about TWN doing digital hydrographic prints. Would you confirm that, please? I need to add them to my list of recommended competitors. I can't wait till BigBrain announces their custom printing service. It's gonna be big! They are the standard that defines all Hydrographic vendors. Perhaps he meant "exclusive" prints, instead of "custom"? My mistake, but when I got trained their they said that they can do custom prints to my specifications and help me thru the design and everything, they also said it was expensive. Its good to know that you can do custom prints. I'm not there yet but when I am I know who to contact! Specialty: Anything Guns, primarily restoration and hot bluing. Hydro dipping services now offered. Anything else that you feel sets you apart: I have been in my father's shop since I was 9, we did everything from custom rifle builds for Safaris, to completely restoring any firearm that came through the door from your everyday CCW pistol, to Martini rifles and anything else. Now I have my own shop in Cincinnati. We take on any project the customer brings and assist them in making their vision a reality. Films purchased from TWN, KANSAS HYDROGRAPHICS, BIG BRAIN, FRACTAL CAMO, SHAWN NAUGHTY. Company name Custom Cycle Hydrographix owners name Roy Orren. Films purchased from: Big Brain, Liquid Concepts, PA Hydrographics, TWN, Atlantic-Hydro, etc.